my 'baking instinct' kicked in and i thought: angelfood cake. i did so many of these when i worked as a baker. it was the nineties and women did not embrace slow food. small portions. they were all about cutting the fat! never mind how much sugar there is in this, as long as there is no fat. and give them big portions please!!! i remember eating whipped cream by the shovel-full, spoons of ganache or rillettes for breakfast - and i had never been as skinny. i just did not understand those ladies. fat was yummy, and still is. 1. Separate eggs; discard yolks or refrigerate for another use. Measure egg whites, adding or removing whites as needed to equal 3/4 cup. Place in a mixing bowl; let stand at room temperature for 30 minutes, they fluff up easier. 2. 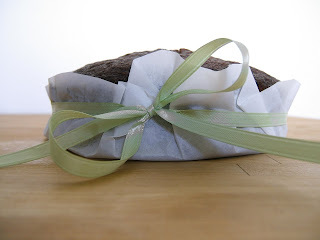 Preheat oven to 350 degrees F and prepare your cupcake pan by lining and/or spraying with non-stick cooking spray. If you are doing this in a big mold, you don't even need to spray, it will separate from the sides and fall when you invert it. 3. Meanwhile, sift confectioners' sugar and flour together three times; set aside. no lumps! 4. Add cream of tartar, extracts and salt to egg whites; beat on high speed. 5. Gradually add sugar, beating until sugar is dissolved and stiff peaks form. Fold in the orange zest. 6. Fold in flour mixture, 1/4 cup at a time. 7. Gently spoon batter into prepared cupcake pan. You should have more than enough for 12. Fill them up and keep the sides clean. 8. Bake at 350 degrees F for 15 minutes or until cake springs back when lightly touched. 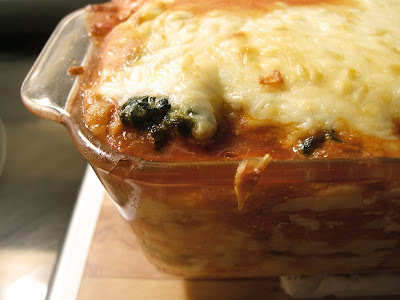 vegetarian lasagna in my mind is... blah. or is a major effort to put in weird ingredients and be original - and not so good. i don't like broccoli in my lasagna. i don't like cauliflower in my lasagna. i don't want nuts or grains in it either. i love meat. most of all though, i love food... Simon and i have noticed in the past year that we do not eat much meat - and this was our first meatless lasagna. i worked with what we had in the fridge, which turns out was pretty decent. *cook the onions until translucent, add the celery. Cook until onion is golden, add garlic and chilies, cook for a few minutes more, add tomatoes and let simmer until ready to assemble lasagna. *cook shallots in butter until slightly golden. Add spinach and cook down. 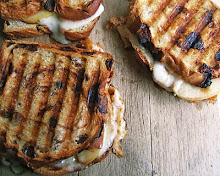 Set aside, mix in garlic, parmesan and ricotta. *put all ingredients in robocoupe and pulse until finely minced. 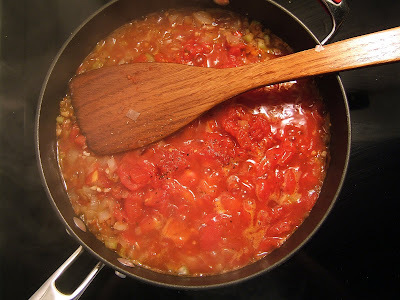 -other stuff to put in the lasagna: 1/2 cup tomato juice + 1 1/2 cup grated mozzarella. layer the pasta, mixes, mozzarella until it almost reaches the top . pour the tomato juice in... this is necessary as the uncooked pasta, although fresh, needs moisture. let the lasagna rest before cutting, it will absorb the juices and slice into neat pieces. i didn't even miss the beef, it was rich and satisfying as it was. i had a very busy 'outdoors' day. right after breakfast, i went out to start building a fence around my raspberries bushes with logs and leftover wood... i then had to scoot over to my mum's house and carry around some garden stones (as she is moving soon and i think the movers will not appreciate stacking those in their truck!). then, i came back home, unloaded her stones from my car. then went on to 'build' paths in our raspberry area with cement tiles. and then cut some trees and bushes. then took out some weeds. then, ouf. i stared at the garden and what was left of it. herbs, tons. overgrowing. major opportunity for rosemary skewers. green peppers. weird. so many are growing. and so so many jalapenos. my mind connects jalapenos with beer. snackfood. i was time for a snack indeed. i have to be inventive with these little guys, we have eaten so many lately. 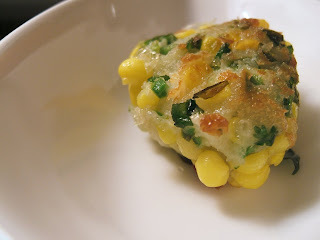 i had some leftover corn, so i thought of fritters. i mixed two 'corn cobs' with 6 chopped jalapenos. I took out some of the seeds. added some cilantro, green onion, one egg white, about 3/4 cup panko. cubed mozzarella and surrounded it with the mixture. fried until golden. dinner was simple and delicious. i have lots of spinach and still some ricotta... how long do these containers last?? i used it in three meals and still have ricotta left. 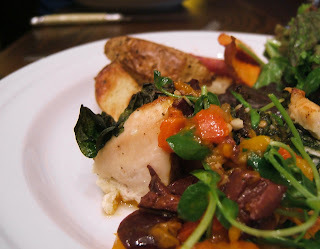 we had roasted veggies and nice bryson greens with spinach stuffed chicken. 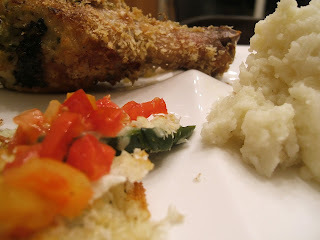 the best part was the spinach: i love crispy spinach, so i 'overstuffed' the top of the chicken breast with some and brushed it with olive oil. it became all crispy-lovely as it came out of the oven. the stuffing was a mix of ricotta, parmesan, mozzarella, shallots, garlic, looooots of pepper. i did a quick sauce with kalamata olives, shallots, garlic, tomato and tossed in pea shoots just before serving. nothing makes you quite as happy as the smell of fresh baked in the morning. 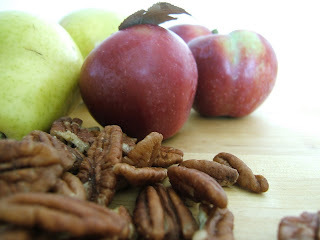 i had pears and apples to work with, and some phyllo dough in the freezer. I started by soaking some Thompson raisins in Grand Marnier. 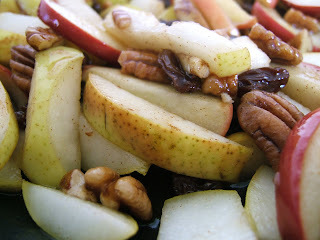 Then chopped my apples and pears, sauteed them in butter and a bit of brown sugar with cloves, fresh grated nutmeg & cinnamon. 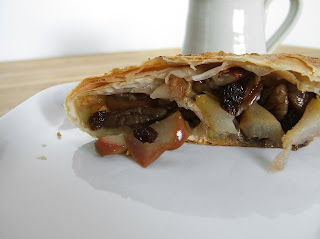 added the roasted pecan and raisins. rolled in 4 layers of buttered + sugared phyllo. 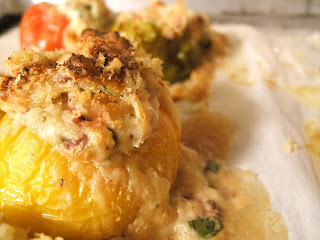 stuffed tomatoes... and crispy coatings. i guess fall weather is getting to me. i want crunchy. comforting. hot. 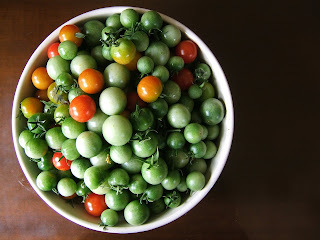 even though what excited me the most today as i was driving home were the greens and tomatoes from Bryson farm, what i was most looking forward to tonight was texture. the sublime tenderness of the veal in contrast with the crispy coating. the delicate tomato skin and the dense filling. melt-in-your-mouth squash vs crunchy fresh greens. i left the veal to soak in milk, as this is what i remember my mother doing. 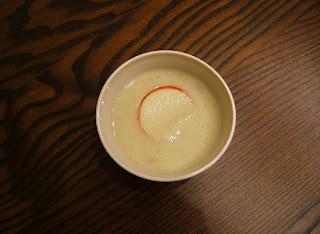 then mixed in an egg with the milk. 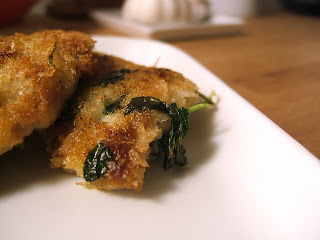 then i coated it with panko & pea shoots from Bryson. it was beautiful and rosy and such a contrast with the pea shoots. it was perfect and crispy when done. we ate this with a halved spaghetti squash (from the Potager Eardley). I wanted to do something different from the usual maple-nutmeg-butter combination. i put some butter in the cavity along with two chopped shallots (french shallots) and put it in the oven at 375. then about 15 minutes before serving i added a good tablespoon full of garlic. right before serving, some pea shoots mixed in. the fun part of preparing dinner tonight was the stuffing of the tomatoes. i had leftover ricotta and wanted to use it before it went to waste. chop the top part of the tomato. empty out the cavity like you would a pumpkin. set aside. dry the insides of the tomatoes with a paper towel. stuff the tomatoes with the cheese filling and press down the panko mix. cook until golden on top. mmmmmmmmmmmmm. ps. in case you hadn't noticed, food makes me happy. i came home totally wanting spicy/junky food. i left work as a mexican class was going, the air tasted yummy. for the junky part of our evening, we did some chicken drumsticks. 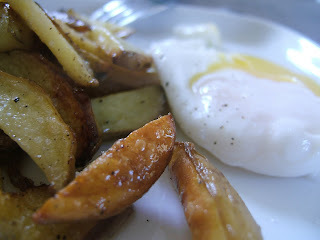 i am really scared of frying, not the fat part, but the hot oil-ouch-ouch-ouch part, so i tend to bake all that i can. the drumsticks came out really crispy and tasty. 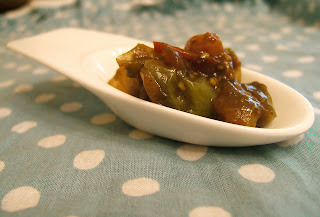 we ate these with stuffed jalapenos (we still have sooooo many in the garden!!! ), a fresh tomato salsa and some mashed potatoes. pat dry the pieces of chicken. season with salt and pepper. in a bowl, mix together 1/2 cup mayo, 1 generous Tbsp of dijon, 2 dashes of Worcestershire, 1 egg. 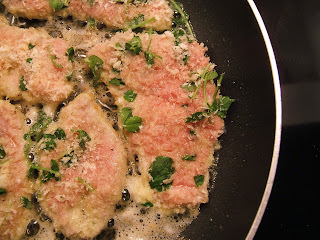 in a separate bowl mix together bread crumbs, one finely minced green onion, salt and pepper. Dip the drumsticks in the egg mixture and then into the breadcrumbs. 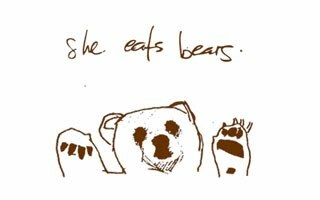 place on a baking sheet lined with parchment. turn every 10 minutes to get an even tan! ha ha! i had chopped the ingredients the night before and got it all started even before having coffee. a lot of the vegetables came from the Potager Eardley, i linked them before, they are a cute farm about 5 minutes from my house. i bought a nice bunch of carrots yesterday and wanted to use up some leftover ingredients from my trip the week before: butternut squash & spicy red peppers. 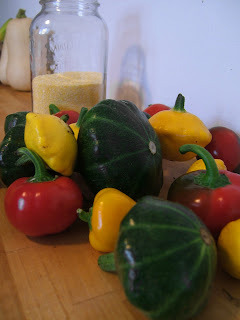 these peppers i have been using in everything this week! i put some in my chicken wings last sunday and in my ribs marinade this saturday. 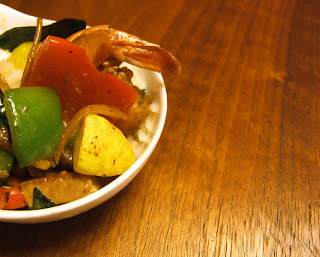 they add a real warmth to cooking as opposed to dried chili flakes. cook your onions in butter or olive oil until translucent. add the garlic, ginger, hot pepper, lime leaves. cook for a few minutes more with the spices. add a bit of chicken stock (about 1/2 cup), then add the carrots and celery. Cook for about 10 minutes to bring out the flavours and pour in the rest of the chicken stock. When vegetables are tender, take out the lime leaves and add the squash pulp: puree in a robocoupe or blender until smooth. 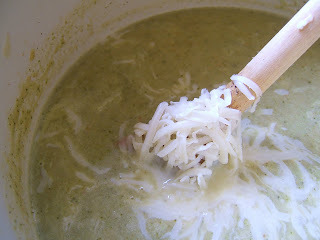 pour back into your soup pot, add the coconut cream and slowly warm through. 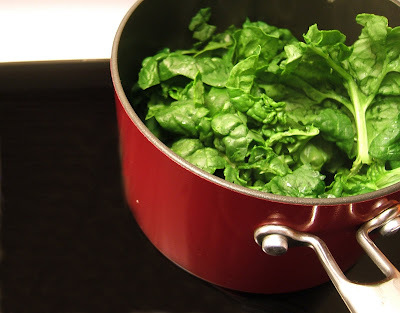 adjust seasoning to taste with salt and pepper, serve with cilantro leaves. perfect for a fall day. 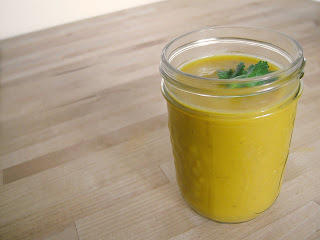 this soup freezes really well, double up the recipe and take advantage of the fresh carrots!!! i was riding home in the bus with my friend stéphanie and we were chatting about our dinner. i was thinking pad thai. but then, that does not heat well, and since simon would probably be hungry as he returns home from band practice, it would not be ideal. and i had no sprouts. and i really enjoy that crunchiness in a pad thai so plan b.
our conversation turned to good thai restaurants and i was reminded of lotus royal thai in hull. i used to go every week for awhile and ate only two things: pad thai and pad khing. both were delicious. during my little walk from the bus stop, i thought i could attempt the pad khing when i got home... but then the couch called me. and popcorn. and america's next top model (don't laugh, we all have our weaknesses!!!). by 7h30 i was ready for st-hubert take-out. brown the chicken in canola oil with the chopped bird's eye chiles. add the shrimp and cook through. set aside in a bowl. last night i did this pasta from scratch. i took an easy recipe from work for the pasta itself and then did a butternut squash stuffing... i mixed in some caramelized onions and apples to the squash, ricotta and parmesan stuffing. 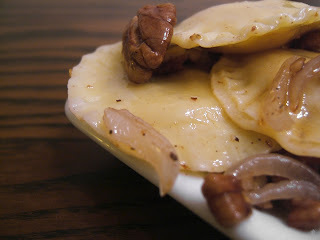 served with brown butter, roasted pecans and french shallots. Add the flour to a large work surface. Using your fingers make a well in the center. Place the yolks, egg, olive oil and milk in the well. Using a fork, stir the egg mixture slowly pulling the flour from the edges of the well into the liquid. Keep stirring until a shaggy mass forms. Knead the dough on a lightly floured surface until it becomes smooth and elastic. About 10-15 minutes. The dough should spring back when pressed with the tip of your finger. 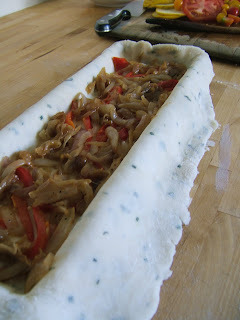 Wrap the dough and let it rest for 2o minutes. 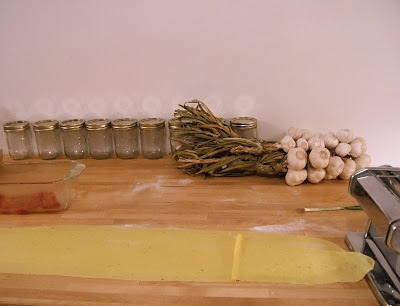 In small batches, roll the dough out into thin sheets starting at setting #1 on your pasta machine and working your way to #7 or 8. Cut into to desired shape and boil in heavily salted water for about 3-4 minutes. soup and chutney and beets and pasta and stuffing...oh my! i came home from work today and felt totally exhausted. i took a nap and then woke up in the body of a little robot-cook. i really had to do something with my tomatoes. so they turned into a chutney. then, from the corner of my eye, i saw the butternut squash. into the oven. with the beets. with the fennel. the beets will be for tomorrow night. i am thinking of a salad. the squash will be transformed into a filling. it is now all cooked and pureed and ready to go into little pasta shapes. the fennel went into a soup that was my dinner. 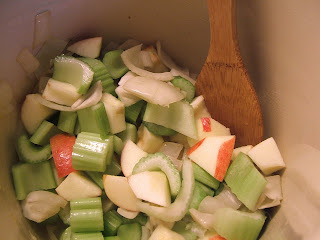 i cooked some onion, then added some apple cider, some leftover Viognier, then added some apples, partially peeled, celery, the roasted fennel. i let it cook down and added some chicken stock, finished it with cream. 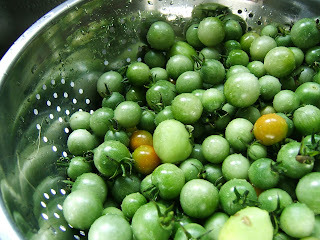 i had so many green tomatoes in the garden that they could not all be saved for fried green tomatoes - even though i looooove those. i separated the tiny tomatoes from the rest and decided to do a chutney. it will be ideal for shepherd's pie and meat pies. 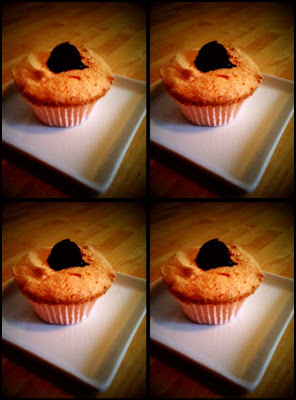 and it came out like this: gooey and delicious. my plan today was to clean out the garden. 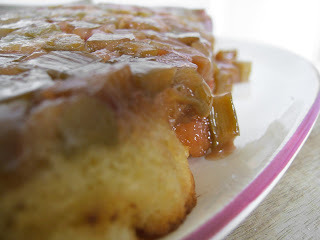 i started out by cutting all the rhubarb that was left. it was used in a delicious upside down cake. 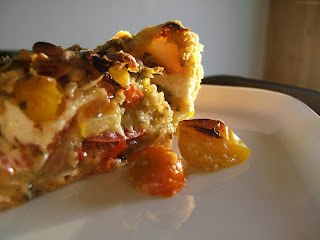 i love this recipe as it is very simple and requires no 'odd' ingredients - i pretty much always have what i need to do it, and it bakes for just 30-35 minutes. i often do it before going to work. get up, mix, hop in the shower, make coffee and ta-da, cake is done. you can do it with canned fruit (the original recipes calls for that), but i have done it with strawberries, apricots, fresh pineapple and it works fine too - less sweet, that's all. Use an 8" square or round pan. Sprinkle brown sugar over melted butter. 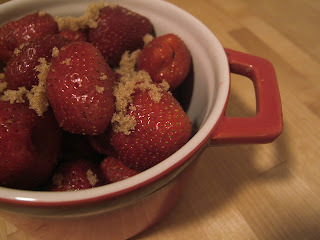 Arrange fruit over the brown sugar in pan. In a bowl, combine cake flour, sugar, baking powder, salt, softened butter, milk, egg, vanilla and 2 tablespoons of the juice of your choice. Pour batter into the pan being careful not to disturb the fruit. a trick not to splatter yourself with hot caramel... put the plate ON the mould/cake pan, put on mits and turn away from you as you inverse it. i started my day by going to a farm just a few minutes from my house. Le Potager Eardley is the cutest farm ever, they sell a lot of veggies, seem to always have strawberries and raspberries, sometimes blueberries... they also sell jams, pickles, chutney and fresh baked pies. the best part, for me anyways, are the little animals up the hill. i came back with squash, little hot peppers, patty pan, carrots, corn, strawberries, yellow bell peppers...yup, i came back with my arms full. we had wonderful butternut squash risotto, creamy delicious. 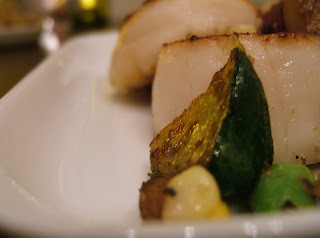 and some scallops with a medley of veggies... and BACON!!!! i diced some potatoes, shallots, sauteed (in bacon fat!) and then added patty pan, fresh corn, green beens, edamame. again, fine seafood from the Whalesbone. we ended the evening with strawberries for sweet dreams. although i almost cried when i saw the price tag, it was well worth it. the flesh was so firm, not one bit slimy and it smelled like...nothing. that is perfection. we started off our evening with beautiful carrots from Bryson Farms. They have a spot on the Parkdale Market on Fridays and Saturdays (i think! Fridays for sure) and it is sooooo worth buying from them. i believe they also sell at the Lansdowne park market over the weekend. Their veggies do not compare. 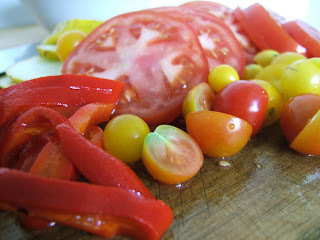 we also thinly sliced some beautiful tomatoes to savour with some maldon salt and fresh pepper. i prepared simon's favourite potatoes. i simply chop up a massive amount of rosemary and garlic, add some garlic powder, panko, olive oil, salt and pepper. i try to turn them frequently in the oven so that they are all golden-perfect. i also treated myself and prepare some fennel-orange slaw. i love love love this with fish. finely sliced fennel, some fennel tops, orange, lemon juice, canola oil, salt and pepper. of course, you could add more to the salad, but i like it very simple. 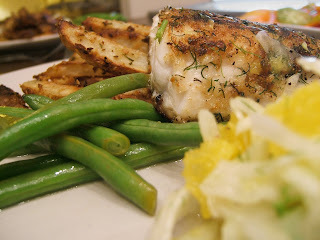 the pickerel was patted down and then coated with chopped fresh dill, a lot of pepper, salt and a bit of panko for crunchiness. 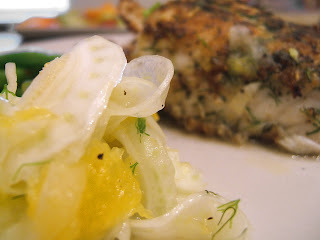 i pan fried it with the skin, finished it with the juice of my fennel salad. a great reward for a busy week at work!! well, my body decided otherwise. i had this incredible neck pain and crazy headache that kept me up a part of last night, and really slowed me down the past two days. i finally gathered the courage to drive up to the market today and get some vegetables. i still had lots of leftover tomatoes, so i decided to make a vegetable pie. then, a broccoli soup (they were 2 for $1, how to resist), and a leek and potato soup. 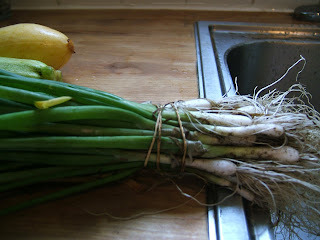 the leeks came from the garden, simon had the honour of pulling them out. so pretty and they smelled so strong and fresh. 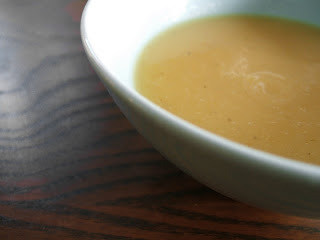 the soup is pretty straightforward, although i like to add some very thin slices of potato (partially peeled) after i have pureed it to add an element of texture. there you go, about 15 portions for our lunches!!! 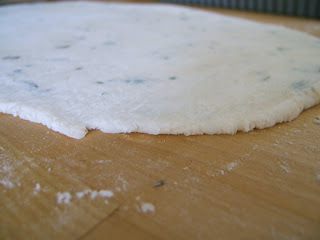 as for the pie, i already had a chive pie dough all ready in the freezer! then i caramelized some red onion. had a leftover roasted red pepper. those two went on the bottom of the pie. 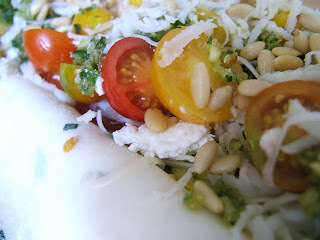 then topped it with layers of tomato, patty pan, 1/3 ball goat cheese (Micha soft goat cheese), 1/2 cup grated Chèvre Noire, pine nuts and some breadcrumbs/herb mixture. 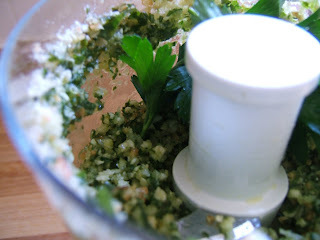 the herb mixture is pretty basic and makes the pie extra tasty and special. I robocouped about 7 croutons (long slices, not tiny cibes), 6 cloves garlic, 2 small bunches of basil, 1 handfull of flat leaf parsley, 1/3 cup olive oil, salt and pepper. into the oven, 400F, for about 40 minutes. very satisfying for a light dinner. too silly to take the time to go to the grocery store. but i had zucchini and eggs. 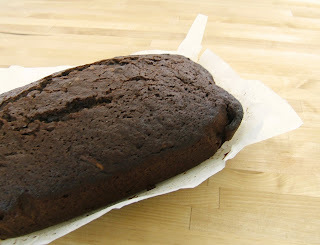 voilà, spiced chocolate zucchini bread. i got up really early (after very little sleep) did the bread, ran across the house to gather things for work, did our lunches, ran across the lawn to get things in the garage, and into the car. i managed to do two 'breads'. one for us, one for Teena, my florist. she got her bag of goodies - i get flowers tomorrow. sweet rewards. if your day starts off with this, you can think that the rest, in a culinary way, will be good. and it was. we've been so busy that we don't have much left in the fridge. going to the grocery store seems like time that i could spend on something else. we have nothing left for a 'normal' weekday breakfast. so oddly, for a week that i need 36 hours in a day, i am taking time to make breakfast. my crazy day ended with a trip to the farm to pick up a csa basket + some goodies for work. 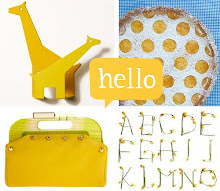 i am so thankful for the basket. these little onions sent me back in time. i am 7 years old again and in the kitchen. 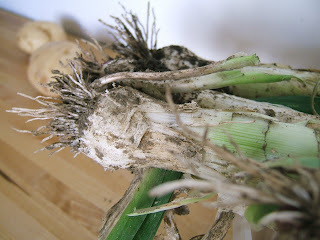 i am hiding and eating green onions with too much salt. in another flashback, i am hiding once again to snack on raw beef with salt. i still crave that so much. we were lucky enough to drop into the Chelsea Smokehouse before closing time. 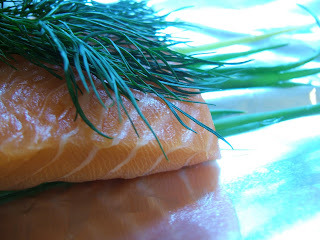 i knew that we were getting dill in the csa box, and that equals salmon. 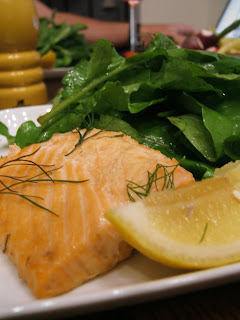 maybe because i am so tired but... that.salmon.was.so.good. i skinned it and put it on the green parts of the tiny onions, the topped it with dill, closed the package and bathed it in Pimm's. i still am dreaming of it. was it the Pimm's? the purple carrots. 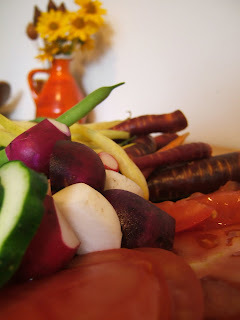 the multi-colored radishes. the tasty cucumber. the perfect tomato. and some simple arugula tossed with olive oil and balsamic. when you have incredible ingredients to start with, you don't need much else.